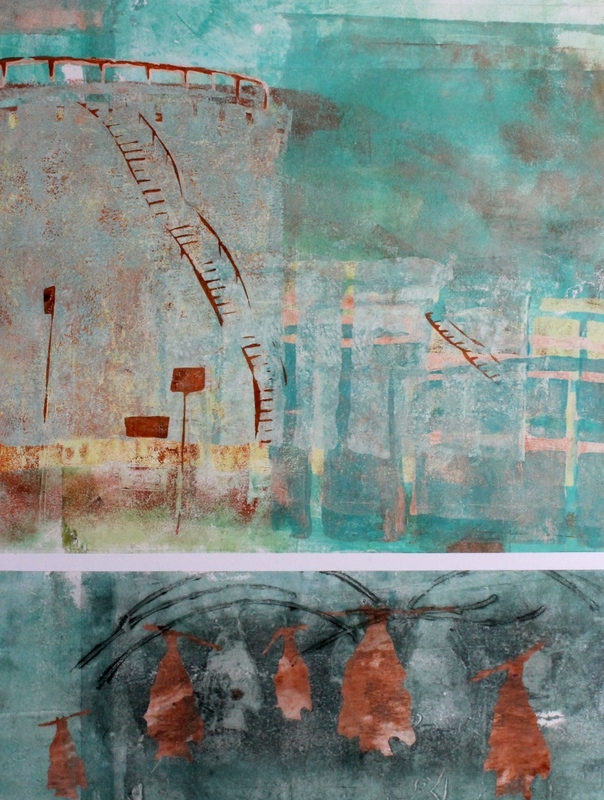 A solo exhibition of monotypes, encaustics and paintings based around the Coal Town of Carrington by Gallery 139 Artist Helene Leane . Works from this exhibition are still available for purchase please contact info@gallery139.com.au for details. An artist often uses their creativity to celebrate or comment on the environment in which they live. This is apparent in my exhibition about Carrington. I have only lived there for 9 months but never has such a place had such a significant impact on my imagination. Covered in a layer of coal dust, it still manages to breathe life. Carrington is a modern day enigma – it is basically still an industrial hub – almost a wasteland on the weekends, with a grid of residents, some with fantastic stories to be told about the history of their suburb. Amongst the industry lies the “belly of the rainbow serpent”, Throsby Creek, with its magnificent mangroves. The mangroves are home to such a variety of animal life – bats, crabs and birds. The fascinating combination of a vibrant animal habitat with the coal, industrial and port activities has allowed me to place seemingly contradictory images in the same exhibition. It is a tribute to the resurgence of a habitat which has an improved ecological balance compared to that of 100 years ago. The debris left in the mangroves as the tide recedes still indicates that we have still much to change, but the vibrancy of the life within as you walk the mangrove boardwalk, shows the ability for nature to bounce back, with just a small amount of awareness. But as long as we export coal from our port, Carrington will always have a sooty layer, an an avoidable fact in an intriguing suburb. "After a run of group exhibitions Gallery 139 presents COAL DUSTED, its first solo exhibition for some time, from prolific artist Helene Leane. This is a well-balanced presented exhibition where the artist’s new home in Carrington has provided the stimulus for these suites of prints and paintings. 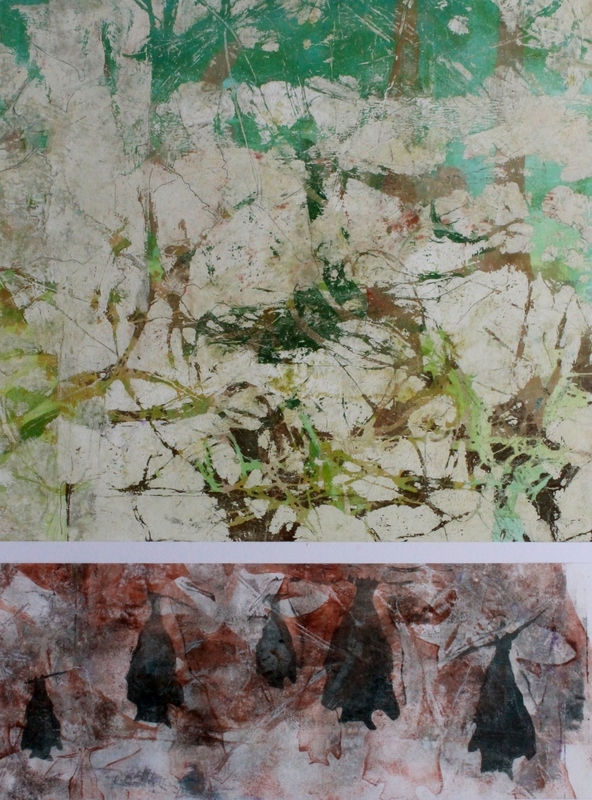 Four series of monotype prints, photo transfers, acrylic and encaustic paintings are linked by shared imagery and a similar colour and tonal range. Silhouetted images of frogs, dogs, skinks, bats and birds are juxtaposed against an abstracted vegetation and a stylised, industrial landscape. While painting is a relatively recent expansion of Leane’s practice and appears a little hesitant, her close-toned monotype prints are much freer and lively." Newcastle Herald 19 Aug 2016, 1 p.m.